FractalFusion's Mega Man 8 in 47:06. PCSX v0.1.2 with TAS Sound Plugin. Recommended to turn off movie sync mode in TAS Sound Plugin, as it syncs fine without it, and plays sound more accurately. Unfortunately, due to various encoding issues Aktan left off the credits by accident, and would rather not redo it. My choice of leaving the ending cutscene in order to shorten the input time (even though I dislike it, and it's pretty long) was pretty fortuitous, as the MP4 and MKV at least have an ending. This is what was left off the proper encode: http://www.youtube.com/watch?v=Mq_7z_JjGYY. Manipulates luck (but not heavily). Genre: Seriously, you should know. TAS Spoiler Alert: Stop reading now if you don't want to be spoiled. Not spoiling for you. Why don't you go figure out yourself? Oh, all right, but it has something to do with Sword Man miniboss. Also, with Rush Bike. Read below for details. Angerfist started doing a MM8 TAS, but abandoned it later. It was then that I took the task of doing this hard-to-optimize but rewarding TAS. Started Jan. 12, 2010. Ended Mar. 29, 2010. I even have a log of my progress. Yes, I once spent 4 hours and ended up in the same place. So much for having to redo sections. Also, three times I ran into a flawed savestate desync. The problem seems to occur if you save after the movie ended and loaded it later. I would have been more raged if I didn't know how to hex-edit. 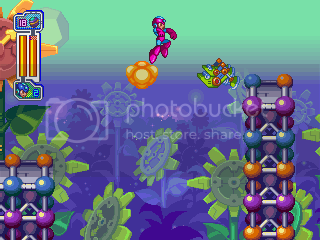 One of Capcom's Mega Man games. Fun to TAS, not so fun to play. Graphics and sound effects are very detailed. On the other hand, voice acting isn't so good. Then again, could voice acting ever be good? The best bosses tear you apart silently. 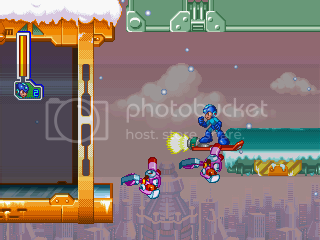 In this part of the Mega Man saga, Mega Man goes on a rampage to hurt and destroy innocent Robot Masters that talk funny; he was going to settle with four at first, but Frost Man was just too much. That's all you need to know about the plot. You can use both a special weapon and Mega Buster at the same time. You can charge up right away after releasing a charged shot, rather than waiting for it to disappear. You can charge up during most scenes while waiting. You can switch special weapons any time, and fire any special weapons any time. (Subject to firing limits on each individual weapon, as well as what you're firing at the moment). 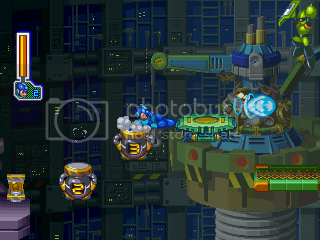 You can arm yourself with Mega Buster only, and autofire 60Hz by alternating the two fire keys. (Subject to three-shot limit, of course). Let's go over the weapons, shall we? Mega Buster: Charge it up, fire. POWERSHOT. 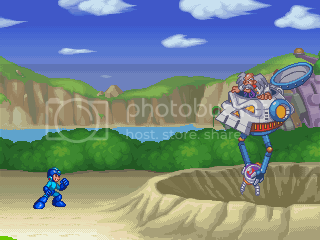 Highly effective, you'd think Mega Man was taking photos. Mega Ball: More a tool than a weapon. 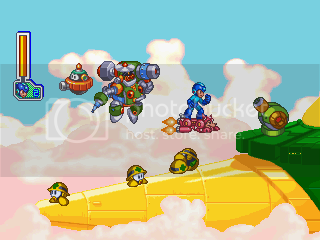 This is the reason Mega Man can fly up very quickly. Even faster if near a wall, as the shots are closer to you. Tornado Hold: Can be used to ascend in place of the Mega Ball. Using both allows you to go up quickly. However, Tornado Hold may interfere with your path. 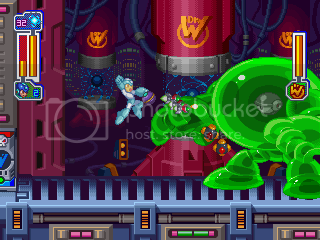 Thunder Claw: Not used much as it prevents Mega Man from acting, except when he's in air. But it does good damage. Flash Bomb: Does good damage, but should be deployed far from the target. Also used on bosses to delay hits (to charge up). Ice Wave: Same as Flash Bomb, except for the delayed hits thing. Water Balloon: Despite the name, it is very powerful and kills non-bosses easily. No shot limit, can be autofired at 30Hz. Flame Sword: Similar to Thunder Claw, prevents Mega Man from acting. Can be used to hit some blocks from above. Homing Sniper: Attacks the nearest (targetable) enemy. Very useful, as it can hit above and below, whereas other weapons can't. Astro Crush: Only used on bosses, as it stops Mega Man. Even then, not so useful. I get only the Hyper Slider, which increases sliding speed. Other items save less, and take more time (you have to collect the large bolts). 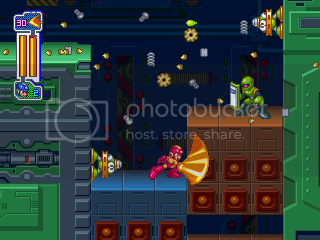 Grenade Man is first due to Rush Bike, which saves a lot of time in Clown Man's stage. Astro is first after Duo because his weakness does only 3 (rather than 4 like others), and Flash Bomb (the best one due to delayed hits) does 2 damage. I needed a lot of it, no doubt. Things that change RNG: Time delay, POWERSHOT, Flash Bomb, Ice Wave, Thunder Claw, Homing Sniper, Astro Crush. Discovering that the pop-ups can be killed saved a lot of time, as well as staying closer to the ground. IIRC I saved about 90 frames here. And by pop-ups I do mean pop-up turrets. This stage took a while to optimize. Sliding over the explosives and timing the slides looks quite cool here. The steel block room's top route is fastest. 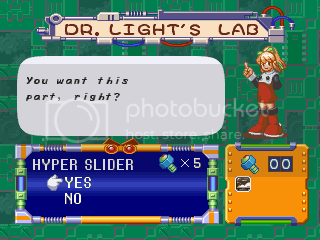 Also, you get to see some nice Mega Ball usage and a well-used POWERSHOT. After the miniboss, I use Rush Bike. I knew about damage double jump glitch, and spent hours trying to get it to the top (and doing it optimally) after the exploding block section. With some genius, I managed to perform it by luring a giant Telly to the right, and having it spit out a small Telly which I use to double jump. Grenade Man, I delay partially charged shots, so I can pull off a POWERSHOT. It does save time, though not that much. JUMP JUMP SLIDE SLIDE. I admit, the autoscroller is fun when it goes fast. Also, at the end of the second autoscroller, there are some hidden powerups. The checkpoint glitch works, but is not worth it. 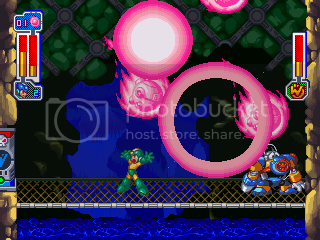 Note that Flash Bombs hit over and over, but by a frame period. So I have to time it right. Rush Bike saves a boatload of time. It's what Atma used to convert me. As a Grenade-first TASer, of course. You are forced to abandon Rush Bike during the bell part. Oh well, the game hates me. Everything else went to plan though. 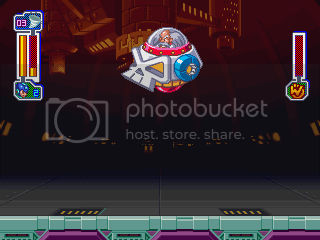 Tornado Hold can be used with Mega Ball to ascend quickly. 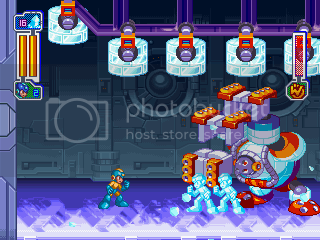 Also, the falling toys that bury Mega Man are manipulated to take place with the shortest time. Clown Man is tricky. He always starts off with a swing. I manipulate so he only does one half circle swing (he can do 1.5 or 2.5, which wastes time). I cannot hit him with Tornado Hold when he does this as he has a long invincibility otherwise. I manipulate him to use Thunder Claw (he makes hands appear from the ground) but he cannot do it twice in a row. The AI is quite smart. I use Flash Bombs to delay-hit so I can POWERSHOT him. POWERSHOT is the only thing that does 2 damage. You may be surprised, but after getting Hyper Slider, Rush Bike isn't worth it anymore (except once in Search stage). That's not such a bad thing, though, since Rush Bike isn't so exciting after a certain point. You can't fire any weapons, except the Rush Bike shots. The path through the mazes seem to be most optimal, although I had to run a few tests. I got in Mega Ball trouble here, so I had to manipulate weapon energy from an enemy. This is why I had to redo part of it for 4 hours. 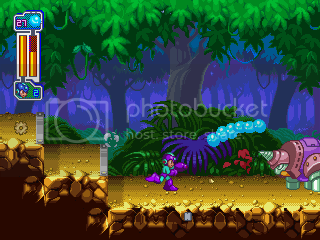 Astro Man, I use Flash Bombs and POWERSHOT. Bleh. Even Rush Bike isn't worth it here. The pressure areas are annoying. The miniboss was fun to beat though. I manipulated him to appear ASAP, not to fade out, and I managed to beat him just before Y-position scrolled back up. You don't see it, but it scrolls from ~2460 back up to ~1500 if you go down that low (this is how it loops). Aqua Man needs 4 POWERSHOT because of not enough Astro Crush. Fortunately Astro Crush allows time to charge. I manipulated the Flash Bomb room panels. That just made my day. Anyway, after releasing the 4th head, you can slide back and forth to skip the head opening. A well-placed Tornado Hold saves time, and I manipulate the miniboss to open after scrolling up once. Now as the miniboss opens, he has no invincibility delay. I do Water Balloon/Mega Buster alternation autofire, which destroys him in 12 frames. Enjoy Rush Bike. It's the last you see of it. And I do damage double jump again. Thunder Claw is useful for grabbing onto the Thunder Claw hooks in the background. It has to be done either close up (no delay) or far away (draws you in very fast). Also, I abuse Water Balloon to short-circuit these fragile robots. Another JUMP JUMP SLIDE SLIDE. Capcom really wants you to die. Of course, this simply gives the opportunity for a TASer to twist the level some more. 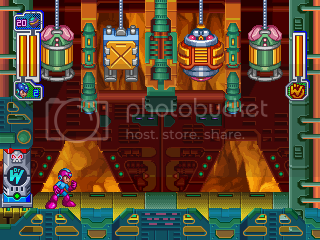 One not-well-known secret is that you can float Mega Man by using Thunder Claw, Flame Sword, or (best) Astro Crush. No, Rush Bike is not faster in the part after. Besides, would you rather see exciting Thunder Claw/slide/jump/destroy or boring Rush Bike? There. A table to describe something which could have easily been described in 200 words. No matter how fast you do it, there is a minimum delay until the click sound (which starts the next cycle), so I don't frame whore. There is a delay between the click sound and when it comes down, which is manipulated to be as small as possible. Starts off pretty interesting. I found out Homing Sniper is useful against Sniper Joe and the flying clown thing. One good use for Flame Sword is here, where you need to hit the blocks underneath. Quite interesting. Then you figure out that there is that Tengu-like autoscroller again. It's not that long though, trust me. And you get to do a little more. Anyway, the boss is a huge ship. Yes, Capcom did their best to remind you it's an autoscroller. The ship dies to Astro Crush. I manipulated it so it did the attacks it does here, and that it spits out as few spiked balls as possible (6). Mind you, it's not possible to defeat it in one cycle. Even if it does its charge attack first. Also, doing charge attack first resets its path going upward, whereas I want it to be as low as possible when it dies. 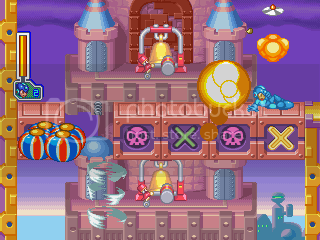 This level. I can't believe how fast I ran into Mega Ball trouble. Give me energy, someone! (I took it off a Sniper Joe). Bass is a pain. I can use Flash Bomb or Astro Crush to make multiple hits and charge up POWERSHOT. Like Duo, POWERSHOT is the only thing that does 2 damage to him. His recovery time is only 30 frames however, half that of most bosses. I make him descend a few times (so I can Flash Bomb him; I only have 4 Astro Crush) but, since the AI has evolved, Bass doesn't do this forever. So I make him do the laser attack, which is not so nice. As if the game can't stop taunting you, I managed to make a W-Tank drop from a normal enemy. Yes, a W-Tank. Of course, not only is it useless at this point, but I can't even grab it without slowing down. I grab a W-Tank from its rightful place, a present capsule drop. Slime Devil, I manipulate so its parts coagulate and dissociate as soon as possible. I thought to start at Search Man (bottom, second from right) and go counterclockwise. That way, you can go directly between the two capsules above. Of the refights, the only one to note is Grenade Man. I found that if you reflect his Flash Bombs (with Thunder Claw), and then Thunder Claw him on the same frame he takes damage from his Flash Bomb, the damage stacks. In other words, you can do 4+4=8 damage at once. I wait before hitting him so that he does his Flash Bomb thing again instead of using Crazy Destroyer. Wily first form is easy enough. Just use Water Balloon/Flame Sword. The second form is long. You can only hit him once per cycle. I empty my stock because I have nothing else to do really. 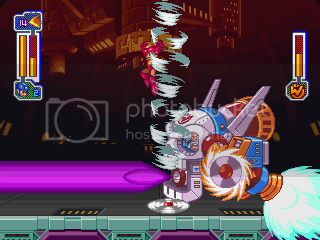 Wily does one of two attacks when he appears on the bottom. You'll see this often because he is unhittable when on the top, unless I use Tornado Hold. On the top, he has a couple other attacks. 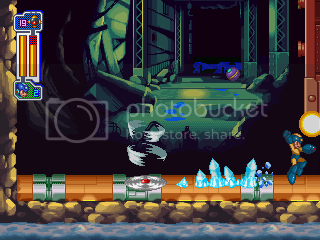 Last hit, I manipulate so he appears on the bottom right, where he ends up when he dies. 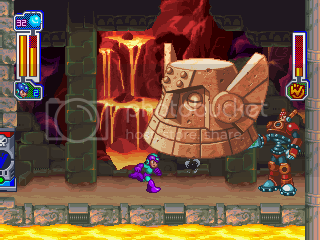 This is a screenshot from the TAS. Where's Mega Man? Actually, it isn't (100%) true. The truth is that PCSX is unable to show the credits, only giving a black screen. Aktan left off the credits, but not by accident. He is also a perfectionist, and would never "rather not redo it". Also, anyone who knows me knows that I would never leave in a 3-minute cutscene I disliked just to have a smaller time showing. I left it in because of the black screen. As for what was left off the proper encode, well, it depends on your definition of proper. There are possible through-the-wall glitches but whether they are of any use remains to be seen. Tornado Hold could be used more. Clown Man's redo was slower than the first one by a few frames. Better luck manipulation for weapon capsules. Other things which I may have missed. Thanks to Angerfist, Atma, Cremator, Rolanmen1, Sir VG, Aktan, anyone who replied in this thread, and others.